This is the first in a series of seven individual works that were inspired by my husband's love of fishing. For him, fishing is so much more than his quest for a fish. It's about peace and quiet in chaotic world. It's about spending time alone. It's about being in nature miles away from anything commerical. 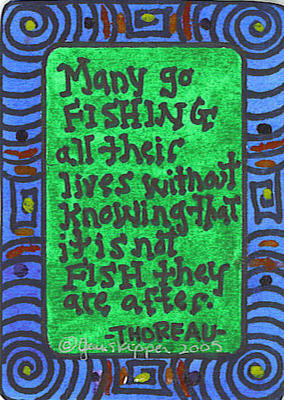 Thoreau "got it" and we could all use a little of "it" in our daily lives. This piece is created on 140 lb watercolor paper. I've used permanent ink and watercolor paint in bright primary colors. This piece was sold to a collector in January 2006.